Every year, the gentlemen of the Theta Beta Chapter of Pi Kappa Phi host a weeklong competition between all of the sororities at the University of West Georgia campus, known as War of the Roses. This competition takes place in order to raise money for their national philanthropy, PUSH America. The activities began on Sept. 15 and will last throughout the week. The first competition is the Post-It War. The different sororities will cover the Pi Kappa Phi house in Post-It Notes and write the name or letters of their sorority on each of the Post-Its. 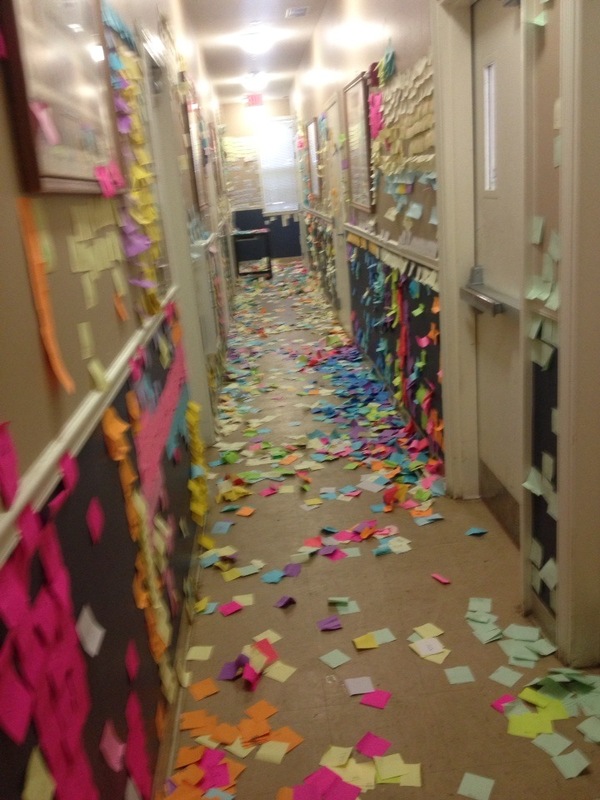 The sorority with the most Post-It Notes around the Pi Kappa Phi house wins the competition. Throughout the week, the sororities will battle between several different contests as well. Other contests involved in the competition include a banner contest, team trivia, a dodge ball tournament and a spaghetti dinner. The week will be capped off with the PUSH Pageant. The sororities will submit a banner for the banner contest and they will be judged based on several different factors. With team trivia, each sorority gets to create a team to compete against the other sorority teams. The spaghetti dinner will be at the Pi Kappa Phi house, and the brothers of the fraternity will be selling tickets for the dinner. Each sorority will nominate two of its members to participate in the PUSH Pageant. “Each of the events throughout the week not only raises money for PUSH America, but the fundraiser is also designed to educate, raise awareness, and change the way the Greeks, University of West Georgia students, and the surrounding community view people with disabilities,” said Kyle Broome, member of Pi Kappa Phi. PUSH America was founded in 1977 and remains the exclusive philanthropy of PI Kappa Phi. So far, Pi Kappa Phi is the only fraternity to establish, maintain and operate its own philanthropic organization. Pi Kappa Phi has pledged a lifelong philanthropic service to those with disabilities. PUSH America has grown into a nationally recognized nonprofit organization. The organization supports numerous different programs that educate undergraduates, alumni and members of the community about the abilities of people with disabilities while hoping to instill the values of teamwork, empathy and integrity. Through local chapter events like War of the Roses, the national fraternity of Pi Kappa Phi has raised over $15 million to date benefitting people with disabilities and organizations dedicated to their service. “Although the funds raised are invaluable, PUSH America notes the importance of increased awareness of the remarkable things people with disabilities can do,” said Broome. After the weeklong events participants will submit the money they have raised to PUSH America. “War of the Roses is an opportunity to change the way people view fraternities,” said Nic Brautigam, Treasurer of Pi Kappa Phi. “This is a chance to show that through leadership and service, Pi Kappa Phi can make an important difference.” Pi Kappa Phi encourages anyone interested in donating to PUSH America to contact Nic Brautigam at nic.brautigam@gamil.com.